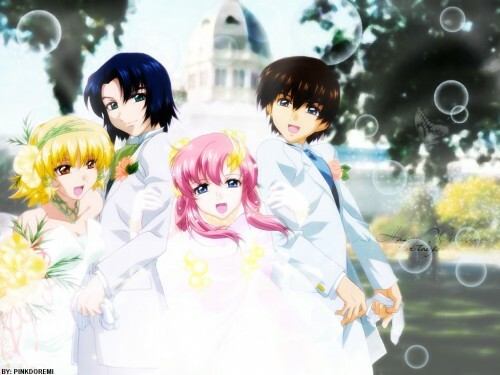 lol, i've been having too much time lately to do stuff -.- anyways.. a wall featuring the wedding pic of gundam seed :D:D the scan was taken from here: http://gallery.minitokyo.net/view/14110/ Thanx for the great scan! Um.. yeah, i cut fllay off and re-cg some of kira's arm back on. i'm not really good at this stuff --;; either way, hope u like it! D: Aww poor Fllay lol. But good job on the walling! I like the bubbles ^^ They make the scene look kinda dreamy. Cute wall....i like :) Nice work!! *trows rice to it* whieeeeee a wedding ^_^! nice job it's prettieh ^^.